The Neuron Doctrine, which posits that most of brain function emerges from networks of synaptically connected neurons, is derived primarily from the detailed descriptions of cell types by Santiago Ramón y Cajal and other comparative neuro-anatomists. One implication of the neuron doctrine is that complete maps of synapse-level connectivity, or “connectomes”, are necessary for understanding complex nervous system function. Though necessary, we currently have very few of these synaptic wiring diagrams available due to significant technological challenges. Recently, high throughput scanning electron microscopy techniques and automated ultramicrotomy have dramatically increased data collection rates(Denk et al., 2012; Lichtman and Denk, 2011; Wilke et al., 2013). Computational advances in image registration and volume segmentation are lowering the significant barrier of data annotation. Several recent papers(Bock et al., 2011; Briggman et al., 2011; Jarrell et al., 2012; Lauritzen et al., 2013; Lu et al., 2009), including my own(Bumbarger et al., 2013), represent the first wave of a new class of data. These emerging technologies make tractable the pursuit of some longstanding and fundamental questions in neuroscience. Some of these questions are the primary motivators of my research program. What can network architecture tell us about network function? When nervous systems change a result of experience, aging, or evolution, can we see this reflected in informative ways in the connections? In pursuit of these questions, my research program places a strong emphasis on interaction between comparative anatomy, graph theoretical analysis for pattern identification and experimental interrogation of derived hypotheses. My recent work introduces the comparative method to the nascent discipline of synapse-level “connectomics” by documenting the extent of synaptic rewiring between species with known differences in feeding behavior. (Cell 152, 109-119) I compared C. elegans, for which there is an existing synapse-level wiring diagram(Albertson and Thomson, 1976; White et al., 1986), to P. pacificus, for which I generated new data (over 10,000 ultrathin sections and nearly 200,000 images) for the anterior region of three specimens. P. pacificus is an established genetic model in evolutionary developmental biology (evo-devo) and has available to it many of the genetic tools and resources available for C. elegans(Hong and Sommer, 2006). Nematodes are ideal for comparative connectomics studies. Eutelic development leads to highly specific cell identities. All neurons are identified neurons and can be compared directly between individuals of the same species. Cell identity is remarkably conserved even between species. For nearly all neurons, homologous cells can be identified between C. elegans and P. pacificus. This has important theoretical consequences. In most compared networks, all of the nodes in the network are different which limits you to primarily statistical descriptions of networks. In nematode nervous system networks, however, all of the nodes are the same giving tremendous leverage in asking more specific questions. P. pacificus has more complex feeding behavior than C. elegans. While both feed on bacteria, P. pacificus can additionally be predatory on other nematodes. This requires additional differential regulation of muscle cells that control a predatory “tooth”, as well as the ability to switch between distinct feeding modes (Bento et al., 2010). There is no precedent for understanding how such additional complexity in function can be encoded in a network composed of the same neurons. I focused first on the pharyngeal nervous system, a self-contained 20 neuron circuit with only a single pair of connections bridging it to the somatic nervous system(Albertson and Thomson, 1976). I expected to find a small number of novel connection types that might correlate with behavioral differences. Instead, I uncovered a massive rewiring of the system between the two species. The rewiring hints at fundamental changes in how information is processed. While about half of the neurons are presynaptic to muscle cells in C. elegans, in P. pacificus all but one are. This additional motor connectivity may be required in order to further modulate pharynx activity during predatory vs. bacterial feeding. Using standard graph theoretical techniques (centrality analysis), I additionally identified a pattern where there seems to be more information flow in the anterior pharynx of P. pacificus relative to C. elegans. This is the region that needs to modify its behavior the most during feeding. 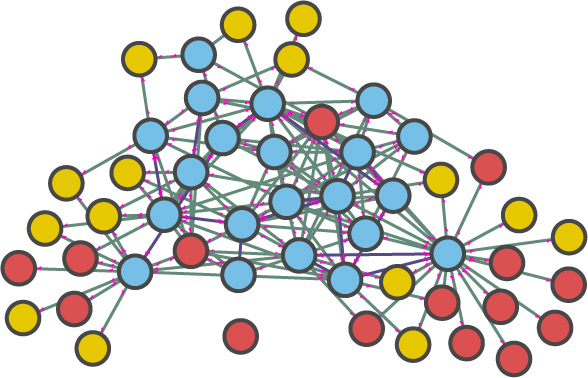 I developed a novel graph theoretical approach (focused centrality) that partitions network flow prior to assessing importance in order to ask more specific questions about network structure. With this I was able to better understand connectivity likely involved in regulating predatory tooth movement and gland function. Hypotheses generated with these methods are being further investigated. Preliminary analysis of the entire P. pacificus brain, which is an order of magnitude larger than the pharyngeal nervous system, suggests the somatic nervous system has a similar level of rewiring. In addition to evolution, changes in nervous system function that relates to wiring can occur in the contexts of aging and experience. My future group will approach all of these contexts for system re-wiring questions in C. elegans by comparing whole brains in animals with different treatments, richly annotated and with sufficient sample size to understand the extent and consequences of variation. This is an approach that to date has not been employed in any system. Hundreds of neurons enter the nematode nerve ring brain(White et al., 1986), yet the entirety of its connectivity can be captured in about 300 serial thin sections. All neurons can be identified in this region by their anatomy. The data used in my current work is comprised of about 10,000 serial thin sections. By focusing future work on the brain, it is thus practical to produce data for 30 individuals without any increase in data acquisition throughput. By applying and improving upon recent technological advances that improve the automation of sectioning, imaging and data annotation, our ambitions for conducting experiments can be multiplied. We will richly annotate the data by counting synaptic vesicles, annotating vesicle morphology, measuring synaptic density sizes and performing on section labeling for specific neurotransmitters. Studies requiring such sample size are at this point only practical in small animals such as nematodes, but as technologies and questions develop I will expand my work to larger animals. These studies can be performed by a small multidisciplinary team. Specialized proficiency in specimen preparation, modern large-volume electron microscopy techniques, volume segmentation, graph theoretical analysis and data resource development are required－ all areas in which I have demonstrated my unique combination of expertise. I look forward to assembling a creative team to push the boundaries of comparative system and synapse-level connectomics. Synapse-level wiring diagrams, or connectomes, are an emerging big-data discipline that hopes to contribute significantly to our understanding of nervous system function. My long-term vision is to understand the consequences of evolution, aging and experience on network architecture and to promote a rigorous comparative approach to connectomics in a collaborative and multi-disciplinary context.